Interactive C Click for more info. This is an inexpensive windows program that can be used to develop software for the 68HC11. It allows development in the C programming language, even for users without extensive programming experience. In conjunction with one of the Mekatronix Education Kits this is an inexpensive way to get started in robotics and microcontrollers. For more information, click here. ICC11 Windows Development Environment Click for more info. This is a more advanced development tool for the 68HC11. It provides a complete environment for creating software to be used on MekatronixTM robots and microcontroller boards. Versions are available for all Mekatronix products. For more information, click here. Robot Education Packages Mekatronix produces a wide variety of software for educational use, as well as support material for teachers and professors ranging from middle school to the college level. These education kits include ideas and examples of some fun and unique things that can be done with the robots. Education kits are available for TalrikII, TJ, TJ Pro, and Robobug robots. Other Education Packages Mekatronix has also developed additional educational packages based on our microcontroller and add-on products. Additional educational packages are also under development, and will be added as they become available. Click for more info The Mindstamp Educational Prototyping System is based around the basic Mindstamp System. It includes all the hardware and software needed to begin learning about microcontrollers and electronics. This is the perfect tool for Engineers, Hobbyists, Professors, Students, Researchers, Physicists, Chemists, Computer Specialists and anyone interested in learning or teaching about electronics. While this system is great for learning about microcontrollers, the Mindstamp system also functions as a powerful design tool for embedded microcontroller design. This upgrade gives your MekatronixTM robot a pan-tilt head to scan its environment. The Argos Education Package includes the basic Argos kit along with additional software and manuals which make it easier to teach and learn about the Argos upgrade and the robot to which it is mounted. Click for more info This ultra-fast downloader for the Motorola 68HC11 microcontroller family is a fully operational 32 bit program that can download Motorola S19 files into your microcontroller's RAM at speeds of up to 115,200 Baud. It is a great tool for development and debugging of applications for 68HC11 microcontroller. Click here for details on this product. The Super Servo software allows you to control up to 16 servos on the MSCC11 board. This software turns the MSCC11 into a potent servo controller for a wide variety of applications. The MSCC11 could be used to control robotic arms, legs, and other manipulators. 8-channel digital o-scope using the 68HC11. Works with all MekatronixTM microcontrollers and robots. When used with the MTJPRO11, you can capture faster waveforms and save them in a 2.8kbyte buffer. This is a great tool for education and robotics applications, as well as testing and designing simple circuits. It turns the Mindstamp kit into a full electronics lab by using OScope11 as a virtual lab bench for reading voltages and waveforms. 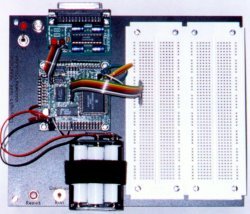 The SuperServo16 package allows for individual control of 16 servos using the MC68HC11. This interface for the Super Servo program allows you to control all 16 servos in real-time and program movements in a 16 degree-of-freedom servo-controlled mechanism. Movements are visually programmed and played back with control over timing of the actions. You can specify upper and lower limits of the servos, as well as where the servo should go based on those limits. Possible projects include: robot hands with human-like motion, android heads that can express emotion through movement, walking robots, animatronics, etc. Take your TJ Pro to the next level! Combined with Argos hardware, RF serial link and RF video link add-ons, this program allows your PC to become the brain of a very smart TJ Pro robot. This package allows you to interface a framegrabber and an RF serial communications system to a TJ Pro so it can use vision to navigate a room. Full source code is also available to allow visual studio programmers full access to the power of this platform. Have your TJ Pro do cutting edge AI research which until now was only possible with $100,000 robots! Experiment with image recognition, insect vision, color detection robot-soccer and any of the other endless possibilities. Robot Kit Distribution Software All Mekatronix robot kits include basic software to help you get started using the robots. This basic software includes installation instructions, core drivers for controlling the robots, as well as the libraries for using sensors. The drivers include code for using timers, servos, sensors, and motors. All robot kits also include basic collision avoidance code to allow you to run the robot right away. The TalrikII and Robobug kits also include source code for the drivers and sensors, as well as the collision avoidance code. TJ Pro Expansion Board Software The TJ Pro Expansion Board interfaces with the Mekatronix MTJPRO11 board. The expansion board includes basic software to use and test the board and the additional sensors. One special program is a line following program for the TJ Pro robot. Argos Pan-Tilt Head The basic Argos package includes software drivers to control the two head servos and avoid obstacles using either the Mekatronix Sonar Sensor or the IR sensor suite. It also comes with a special hemisphere scan program which is useful for checking the area around the robot for obstacles. The Argos package includes not only the object code, but also the source code to provide examples for you to add.